If cow’s milk is meant for baby cows and not humans, what should humans add to cereal and coffee? Well, nut milks are one great alternative. Milk can be made from a number of different nuts including pecans, Brazil nuts, Macadamia nuts and, of course, almonds. Sure, you can buy almond milk at the store, but what you may not realize is that store-bought milks contain preservatives and other chemicals. How else could they have a shelf life of 2 months or more? Making nut milk at home is super-simple. The refrigerator life is short (about 5 days), but making a new batch once a week is no chore at all. 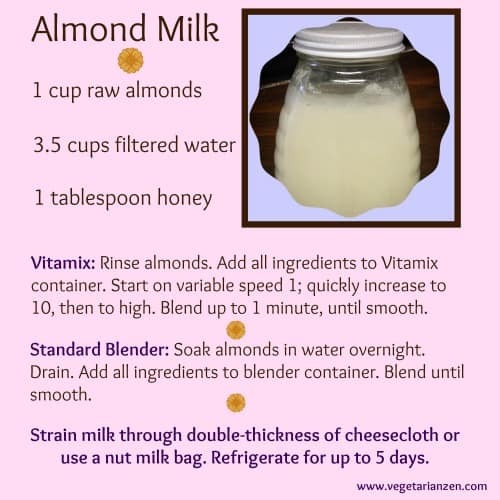 Follow these easy instructions and you’ll be enjoying fresh, delicious almond milk in no time. Add all ingredients to Vitamix container. Start on variable speed 1; quickly increase to 10, then to high. Blend until smooth, up to 1 minute. Add all ingredients to blender container. 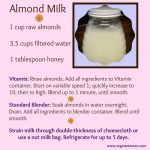 Strain milk through a double-thickness of cheesecloth or use a nut milk bag. Store in refrigerator up to 5 days.